After coming up just short in the opener of the BAPS Coatings and Supplies 410 Sprint Series back in April, Lance Dewease turned the tables on Greg Hodnett Sunday night at Susquehanna Speedway. Dewease drove around Hodnett on the 22nd lap and went onto score the win in the inaugural Hessiron.com Kevin Gobrecht Classic presented by Brickers Famous French Fries. Aboard the Don Kreitz, Jr owned #69K, Dewease was fast all night, setting quick time over the 36-car field in time trials with a lap of 14.208 seconds then scoring the win in his heat race. 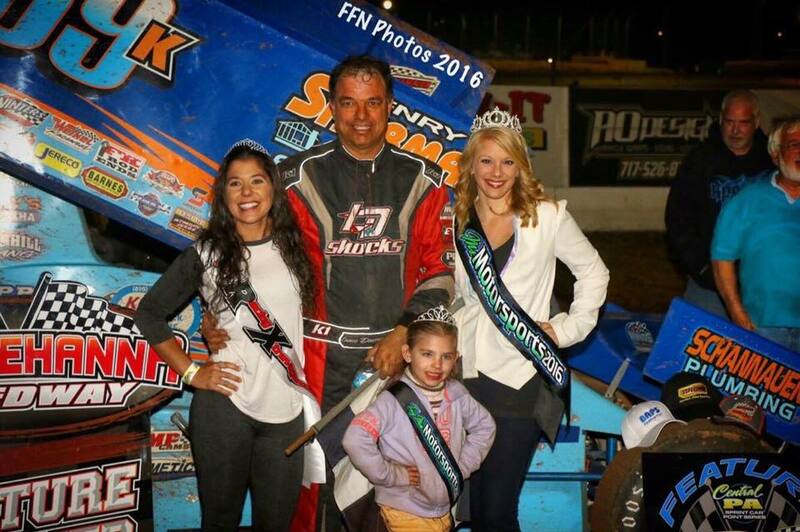 By virtue of his dash win, Hodnett, the winner of the April 10th BAPS 410 Sprint Series race at Susquehanna grabbed the early lead over Steve Buckwalter in the 30-lap Gobrecht Classic. Hodnett drove away from the field during the early laps and had a near three second lead wiped out on lap seven when Cory Haas stopped on the track to bring out a caution. Hodnett again opened up a lead following the restart as Dewease, who started fourth on the grid was looking for ways to get around Buckwalter for the runner-up spot. Just past the mid-way mark of the race, Hodnett changed lines on the track which allowed Buckwalter and Dewease to close dramatically and once Dewease disposed of Buckwalter with 20 laps complete, he went after Hodnett and drove around the middle of turns three and four to take the lead with 22 laps in the books. Hodnett faded after losing the lead but closed to within two car lengths of the leader on the final lap before Danny Dietrich’s flip in turn two brought out a red flag. Dewease wasn’t to be denied the win, holding Hodnett off in the one lap shootout to take his first win since joining the team. Hodnett settled for the runner-up finish ahead of ninth starting Brent Marks, Aaron Ott and Buckwalter with Ryan Smith, Lucas Wolfe, Tim Shaffer, Bill Dietrich and Rodney Westhafer completing the top 10. Dewease, R. Smith, Hodnett and Ott were heat race winners. 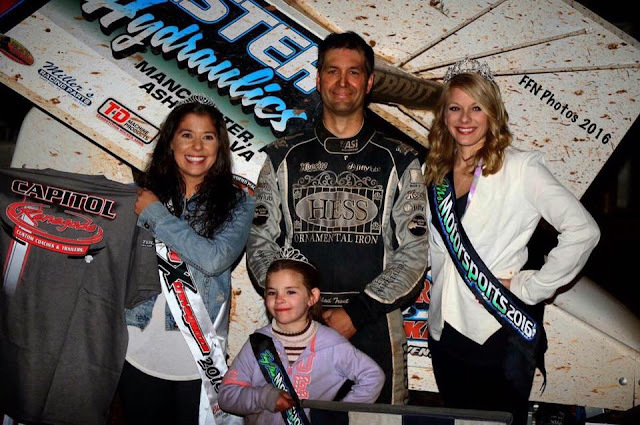 The B-Main was won by Mike Bittinger. Dover’s Chad Trout took the lead from Jordan Givler with five laps in and held off the late race challenges of Doug Hammaker and Kevin Nouse to win the 20-lap 358 Sprint car feature. Following the top three were Givler, Dwight Leppo, Brent Shearer, Adrian Shaffer, jared Esh, Glenndon Forsythe and Dalton Dietrich. Heats for the 30 358 Sprints were won by Forsythe, Esh and Chris Frank. Steve Drevicki won the consolation. Did Not Qualify: 39-Anthony Macri, 1080-Jordon Mackison, 1X-Chad Trout, 75-Frankie Herr, 99M-Kyle Moody, 19-Colby Womer, 91-Anthony Fiore, 5B-Justin Barger, 21T-Scott Fisher, 49H-Bradley Howard, 10-Joe Kata, 55W-Michael Wagner. 25 LAPS: 1. 21M-Chad Trout, 2. 66-Doug Hammaker, 3. 1J-Kevin Nouse, 4. 90-Jordan Givler, 5. 4-Dwight Leppo, 6. 12S-Brent Shearer, 7. 27S-Adrian Shaffer, 8. 30-Jared Esh, 9. 21-Glenndon Forsyhe, 10. 9-Dalton Dietrich, 11. 35-Tyler Esh, 12. 23-Chris Arnold, 13. 41-Jeff Halligan, 14. 19S-Steve Drevicki, 15. 77-David Holbrook, 16. 7-Trey Hivner, 17. 14C-Dave Carlberg, 18. 80-Todd Reed, 19. 00-Chris Frank, 20. 8-Rich Eichelberger, 21. 67-Justin Whittall, 22. 16-Matt Campbell, 23. 18-Nyle Berkes, 24. 12B-Mike Bittinger. Did Not Qualify: 90-Bradley Howard, 5A-Brian Allman, 10-Brody Treaster, 77K-Steve Kissamore, 5-Phil Walter, 17G-George Streaker, Jr.